This cake was for my daughter’s 7th birthday. First, I covered the board in pink fondant – this is important to do a few days before the cake is needed, as it takes some time to set, and will save much frustration later on, promise! I then baked two cakes – a standard round cake, and a cake in a metal bowl (you know the kind, usually sold as mixing bowls). I covered the round cake in white fondant, to serve both as the base for the carriage cake, and to extend my servings somewhat, as the carriage cake would not have been enough for all. 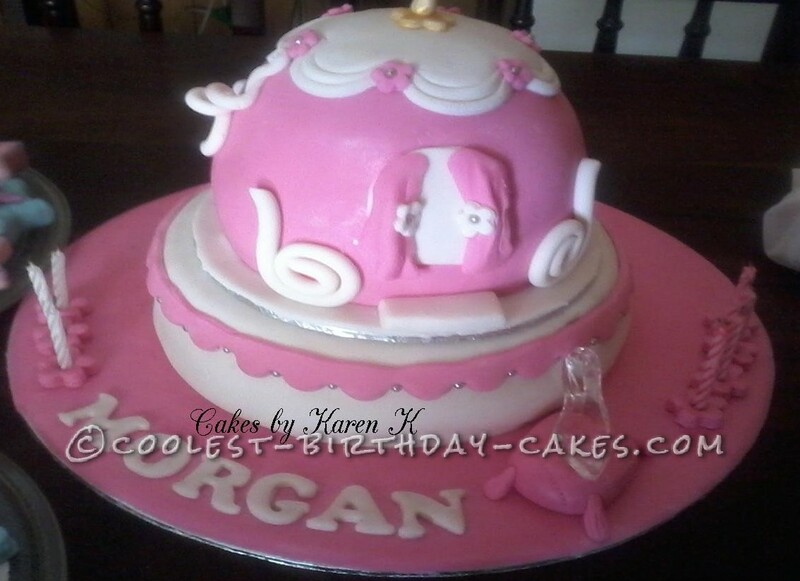 The carriage cake was carved so that it was a little rounder on the top, and then iced with buttercream and covered with pink fondant. I cheated on the top part – didn’t have the time and patience to make the draping, so I cut out a flower shape, and then used my sugar craft gun to make some ropes, and just looped them around the flower, so they looked like draping… I then cut out windows, made little curtains and used the ropes to make the “wheels”. I used smaller flower cutters, rolled out fondant thickly to make the candle holders, and the shoe was actually one of those cell phone charms that I had found at the Crazy Store – cost me ten bucks:). My daughter was ecstatic with the cake, and the guests were quite impressed….turned out to be a pretty good party! 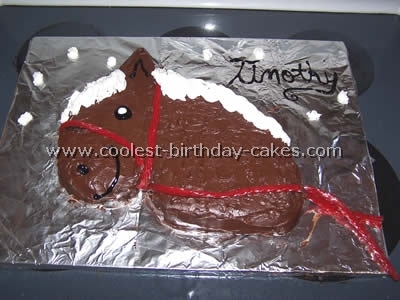 Birthday cake idea Posted by Karen K.